In the late afternoon of august 3 of the last year, I began the Vespatour, a journey that gave me a lot of surprises I’m now describing here on the blog, a bit at a time. The Siena’s Palio always fascinated me: a competition so ancient and beloved by the people living there I thought it had something special I couldn’t grasp by solely watching it on TV. So last year I coordinated the stops of the journey to be able to attend it. In the afternoon of august 16, after visiting San Galgano’s Abbey, I arrived in Siena just before the start. The atmosphere was incredible: the Contradaioli (citizens living in specific areas of the town) thrilled for their jockey and his horse, while tourists assisted to the big show. The Contrada della Selva won the race, the one where I parked the Vespa, so I immediately left Siena heading towards Cortona just as the celebrations began. My solo-journey of the last summer, the Vespatour, continued from Florence towards southern Tuscany. I slept one night at the Ostello del Chianti in Tavarnelle Val di Pesa and I enjoyed it thanks to the people I met there: Silvia, the hostel’s manager, and Alessio, a biker from Torino. Valentina, a girl I met in Florence, recommended me to visit the mysterious Monteriggioni stronghold and to search for the even more mysterious cats without tail living there. So I did it, and in the evening of august 15 I also visited San Gimignano, the town with 100 towers. Then I reached La Meridiana in Montieri in the Maremma area to bring Elisa’s greetings to Mrs. Mirella, the manager of the agritourismo. In Palazzetto, along the road to Siena to attend the Palio, I met by chance Alberto, Angelo e Claudio, three Vespa-riders from Mantua and we lunched together. After three nights spent in Lucca, the Vespatour continued into the hearth of Tuscany towards Florence, passing by Vinci, where a museum dedicated to Leonardo is located, and then in Anchiano, where I visited the birth place of the tuscan genius. In the afternoon of august 13 I entered for the first time in the Uffizi Gallery, a place so full of masterpieces, the Birth of Venus by Botticelli above all, that once out I think I felt the symptoms of the Stendhal’s syndrome: “What I’ve seen!” I was repeating to myself while walking in the town center. The 52 photos of the ninth gallery of the journey I did to discover the wonders of the Belpaese are online. 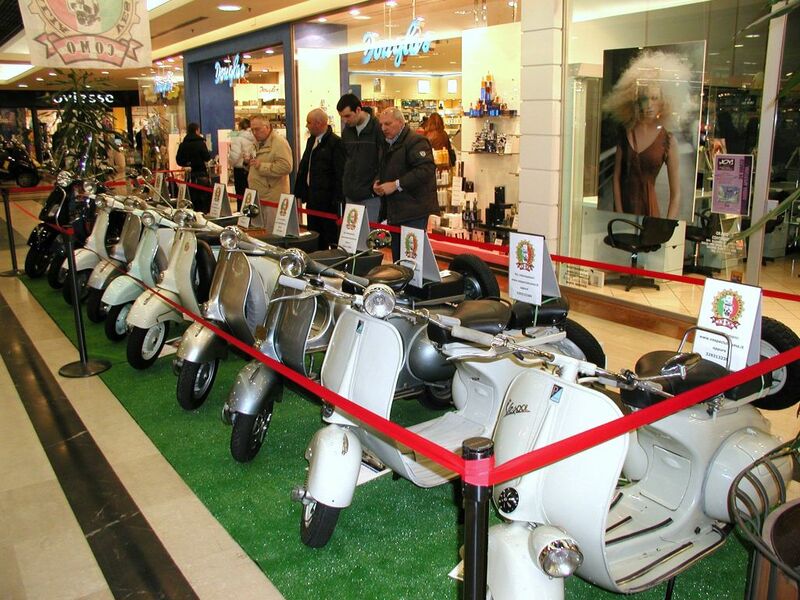 For a Vespa rider visiting the Piaggio Museum in Pontedera it’s like a sort of pilgrimage to the Mecca, the origin of everything, where you have to go at least once in your life. Pontedera was an obvious stop of the Vespatour and while visiting the museum I had the feeling to assist to the celebration of a myth. 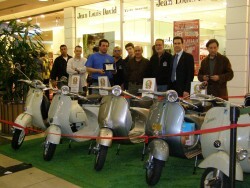 While I was watching the video of Corradino D’Ascanio on the Pda-guide available to visitors I was impressed by the easy and friendly way with which he explained how he designed the Vespa. Enjoy the 59 photos of the eighth gallery of the Vespatour celebrating the Vespa, a little airplane that one day left his wings in the sky to become a myth on earth..
Do you know why they call Field of Miracles the famous square in Pisa where the Duomo, the Baptistery, the Monumental Camposanto and the even more famous Leaning Tower are located? I’ve already been there when I was a child, but on 11 august 2006, after spending the whole day there I built a pleasant memory of the view of the perfectly proportioned buildings and the harmonious spaces among them. Not to speak of the Tower and the treasures stored inside the Opera del Duomo Museum where I met a guide who explained me the origin of the square’s name and also allowed me to try the PureForm system in the museum. The third and fourth galleries of the Vespatour, one hundred photos shot during the two days I spent in Genoa on august 6 and 7, are online. During the two days I walked around the city, its Alleys and the Ancient Port; I visited the civic museum of natural history and the aquarium. I also spent an evening in Rapallo and had a dinner in Chiavari with a couple of ex-colleagues from Trecision, the videogames development company I worked for in the past. Enjoy the photos from Genoa!